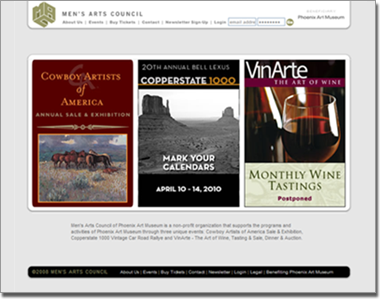 Men's Arts Council of Phoenix Art Museum is a non-profit organization that supports the programs and activities of Phoenix Art Museum through three unique events. For Mens Art Council, Lurus built a customized ecommerce website with an administrative area which allows for event posting, ticket sales, and customer account management. Each of the Men's Art Council events allow for a customized display of information to meet the needs of the event.